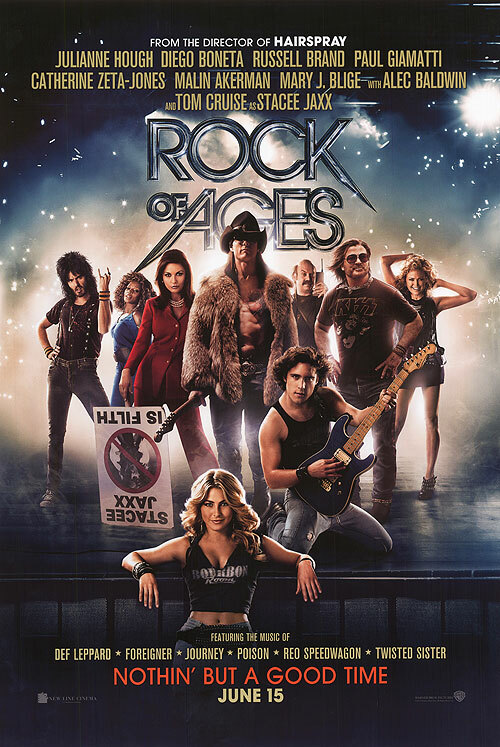 Rock of Ages is based on the jukebox musical of the same name, which opened on Broadway in 2009. With an A-list cast, and built-in audience of both fans of the show and music from the 80s, it is sure to open strong. But for those who aren’t normally inclined to watching musicals, there isn’t a strong chance it will make you a believer. The year is 1987, and Sherrie Christian (Julianne Hough) is travelling from her country home in Oklahoma to try and make it big in LA. After getting off the bus, and singing “Just Like Paradise,” she has her most prized possessions stolen – a suitcase full of her favorite records. In an unsuccessful attempt to stop the robber, she meets Drew (Diego Boneta) – a rock singer/songwriter/busboy at the hottest nightclub on the strip – The Bourbon Room. Knowing that he would otherwise be sending her on her way with no job or friends, he offers to get her a job at the Burboun. She is hired on the spot by the club’s owner, rock enthusiast Dennis Dupree (Alec Baldwin) and his assistant Lonny (Russel Brand), knowing that they will need all the help they can get for an upcoming show. Infamous rocker Stacee Jaxx (Tom Cruise) and his band Arsenal are set to perform their last show together at the Bourbon, helping the club to pay their back-taxes and stay open. Meanwhile, as the staff of the Bourbon Room are getting ready for the big show, Mayor Mike Whitman (Bryan Cranston) and his wife Patricia Whitman (Catherine Zeta-Jones) are trying to clean up the city. And their number one target is the Bourbon. Patricia’s troubled past with Stacee Jaxx while she was in college leads her on a rampage, as she does everything in her power to ruin both the club and his career. Unbeknownst to Jaxx, his manager Paul Gill (Paul Giamatti) is busy doing the same thing with his terrible greed-fueled managerial skills. Rolling Stone sends a reporter, Constance Sack (Malin Akerman), to cover his last show and the reason for the band splitting – leading to an unflattering article to be released in the magazine. While all this is going on, Drew and Sherrie are both falling in love, and trying to figure out what they want to be when they grow up. If I said that Rock of Ages wasn’t predictable – well, I’d be lying. It is definitely your average paint by numbers love story musical. With that being said, it was still a lot of fun to watch. The music selection is great, and the way it tells the story works very well. Sure, there were some iconic songs from the 80s that were left out – no doubt due to monetary restraints in the original show. But the music that was in there was great. Some of the best scenes featured Cruise as Stacee Jaxx singing “Wanted Dead or Alive” and “I Want to Know What Love Is” while seducing Malin Akerman’s character. Julianne Hough and Diego Boneta are okay and somewhat charming as the leads, but it is Tom Cruise who really steals the show. At first I wasn’t sure what to think of the A-list superstar playing the aging rock-god. But after a few minutes of screen time, it is obvious that he is the best part of the movie. You can’t help but to think that no-one would know being disconnected from reality living a larger-than-life persona than Cruise. The actor has been a leading man for nearly 30 years now, and hasn’t hit the brakes yet. 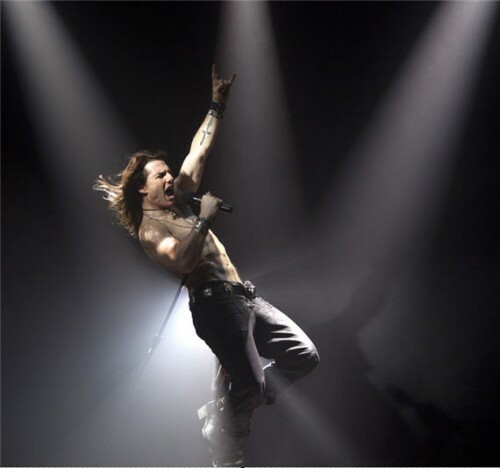 His portrayal of Jaxx, while just as over-the-top as intended, is entertaining every time he comes on-screen – and his singing isn’t half bad either. I think that his portrayal of Les Grossman in Tropic Thunder must have been his audition for the film. And the actor, who turns 50 next month, knocks it out of the park. The film has a good supporting cast that helps keep things lively. Baldwin and Brand have great chemistry together while trying to keep the Bourbon Room alive, while Paul Giamatti does a great job as the sleezy manager that tries to screw anyone and everyone over that he can find. It was fun to see Bryan Cranston as the mayor who is really being bossed around by the woman running the show behind the curtains – Zeta-Jones’ character. It is quite entertaining to see her character doing everything in her path to ruin Jaxx, while her husband says “yes dear” and runs off to fool around with his secretary. 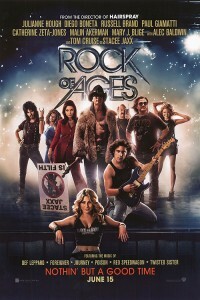 If you are a fan of musicals, or Rock of Ages in particular – there is no doubt that you will enjoy the film. I didn’t have a chance to see the show when it came to town, but from what I have read the movie is a pretty straight forward adaptation of the musical. Although at times it can be a bit hokey and predictable, you have to remember the source material. It isn’t trying to be anything other than what it intends to be, which is a fun rock show with great music and entertaining characters. If nothing else, it is fun to see these well known actors recreate some of the biggest songs of the 80s while they look like they are having a blast doing it.